The most expensive beer produced by Sam Adams has been released for 2011. Utopias is legendary in the beer world, not only because of the price, but because of how it’s made. Stylistically, Utopias is an American strong ale. It’s more than just a single brew, it’s a blend of beers that have been aged in wood casks for up to 18 years. There are even a range of casks, including sherry casks from Portugal & Spain, port casks, & Madeira casks. (Madeira is a Portuguese wine from the Madeira islands.) The blend adds massive complexity to the beer. 53 barrels used in all. With a specialty beer this unique you wouldn’t do something as mundane as bottle it. It comes in a decanter. Suggested serving size is 2oz, served in a snifter. The beer weighs in at 27%, so a little goes a long way. (Boston, MA) — Craft beer pioneer Jim Koch, founder and brewer of Samuel Adams beer, invites drinkers to explore the most extreme beer with the unveiling of the 2011 batch of Samuel Adams Utopias®, available this May. Meant to be savored like vintage fortified wine or fine cognac, this strong, rich, uncarbonated dark beer is best served as a two-ounce pour at room temperature in a snifter glass. Samuel Adams Utopias is brewed in small batches, blended, and aged in the Barrel Room at the Samuel Adams Boston Brewery. Following its first release in 2002, Utopias received the coveted title of world’s ‘strongest beer commercially available’ in the Guinness Book of World Records. 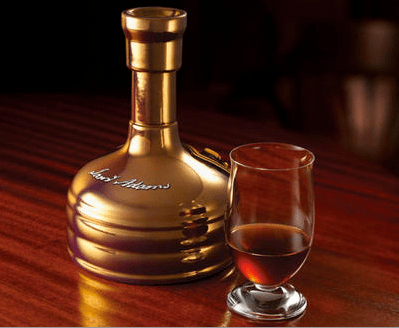 The 2011 offering of Samuel Adams Utopias weighs in at 27 percent alcohol by volume. The average beer is around 5 percent. The 2011 batch of Samuel Adams Utopias is a blend of liquids which have been aged in a variety of wood casks for up to 18 years. This complex aging process enhances the beer’s distinct vanilla, maple and cocoa notes, and it offers an aroma of ginger and cinnamon. Sherry casks from Spain and Portugal add nutty oak, toffee and honey notes, while Madeira and port casks offer a slightly more elegant, dark fruit aroma, imparting earthy flavors inherent to fine European spirits. The complex flavors intensify individually over time, making Samuel Adams Utopias a very special brew that becomes even better with age. Samuel Adams Utopias is brewed with both ale yeast and a variety typically reserved for champagne. A unique blend of several malts gives the beer its rich ruby color and three varieties of Noble hops – Spalt Spalter, Hallertau Mittelfrueh, and Tettnang Tettnanger – give the beer its floral character and spicy note. The limited edition 2011 Samuel Adams Utopias comes from just 53 barrels, all brewed, blended and aged at the Samuel Adams Brewery in Boston. This limited distribution brew is hand-bottled in numbered, ceramic brew kettle-shaped decanters, available at select specialty beer and liquor stores this May in honor of American Craft Beer Week. Hitting shelves just in time for Father’s Day, Samuel Adams Utopias is sold at a suggested retail price of $150.00 per bottle. For more information, visit www.samueladams.com.